It’s been awhile since I’ve posted anything sewing related so I thought I’d jump in with some back to school outfit ideas with sewing pattern suggestions to achieve those same looks. First up is this cute outfit from Gymboree*. The pieces can all purchased separately, so switch it up if you’re not liking certain pieces! This a great outfit for those school days where it’s warm in the sun but gets cool in the shade. What I love about the dress is that it’s so flowy and roomy, great to move around in. A similar sewing pattern I found is the All Spice dress* from Paisley Roots. It’s a super cute dress and fairly easy to sew. I made a version that you can see here. Depending on where your child’s measurements fall in the size range it will look looser (like my version) or more fitted like the photo above, if you prefer a looser fit I would size up in the width. The pattern comes with a long sleeve version that you could modify to look more like the inspiration piece from Gymboree. The other major difference is that this dress buttons up in the front but it could be modified to look to have them in back. I love a chunky sweater, and I love the grandpa-ness of a v-neck sweater! Since the Gymboree sweater is knitted it will be difficult to get an exact match by sewing one but a similar look in thick knit fabric is doable. The V-neck cardigan is super cute and you can always leave off the buttons and buttonholes to make it a closer match (and quicker sew!) to the Gymboree sweater. I would also suggest doing appliques if you really want something as close to the original sweater. In the photo of the Gymboree outfit the girl has a cute little purse, I couldn’t find it on their website so I thought I would share my favourite little girl’s purse. It doesn’t look anything like the purse in the photo but this is my favourite one I’ve made so far for my girls and I think would make a cute addition to any outfit. I’ll be back next week with another outfit and more sewing pattern suggestions. Until then! Back to School Tour Day 2: Clothing checklist, giveaways and more! It’s Day 2 of the Back to School Blog Tour!! I can’t believe summer is nearly over. It went way too fast this year! Day 2 means more bloggers and more giveaways! Yup. BUT before we get to that, I have a back-to-school clothing checklist to share with you. I’m no graphic designer so it’s not super pretty with lots of colour and glitter.. (well, no digital glitter, you could always glue some glitter to it after printing it out). It’s basic black and white with enough space to check off the amount of pretty much anything you might need for a Fall and Winter clothing closet and some space to write in sewing pattern ideas. 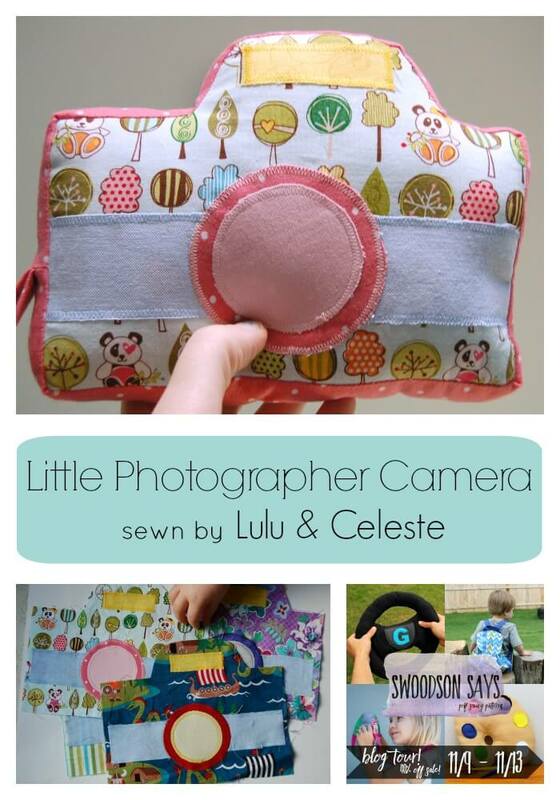 Today I’m sharing one of the Little Photographer Cameras I made from the Swoodson Says pattern. The cameras are super cute.